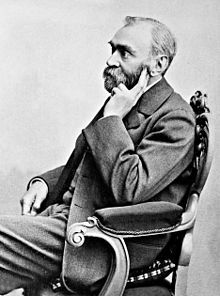 Alfred Bernhard Nobel ( pronunciation (help·info)) (21 October 1833 – 10 December 1896) wis a Swadish chemist, ingineer, innovator, an armaments manufacturer. He is the inventor o dynamite. Nobel an aa awned Bofors, which he haed redirectit frae its previous role as primarily an iron an steel producer tae a major manufacturer o cannon an ither armaments. Nobel held 355 different patents, dynamite being the maist famous. In his last will, he used his enormous fortune tae institute the Nobel Prizes. The seenthetic element nobelium wis named after him. Wikimedia Commons haes media relatit tae Alfred Nobel. This page wis last eeditit on 24 Februar 2018, at 05:55.